Recently Game Central talked to Rachel Franklin, the vice president and general manager of The Sims Studios on the eve of The Sims™ 4 Get Together release announcement.Below is the important portions of the interview and my opinion on their discussions on those portions. Game Central : So I have to admit I really liked The Sims 4. Rachel Franklin: I’m glad to hear it! Game Central :I was quite addicted to The Sims 2 for a while, but then I didn’t really like the open world element in the previous game – and I know that fans are divided on that issue. Rachel Franklin:It’s been a contentious issue. But my feeling is that with the open world it’s harder to feel as connected with the town and your sims. Game Central : It’s like it stopped being a virtual doll’s house and started turning into GTA without guns or something. Which for me started to miss the point, because it’s not like it was all supposed to be hyper real – you’re not supposed to confuse it with reality. Rachel Franklin: I think you’re spot on, right? We went for… how can we get that personality to come across, and the best way to do that, we felt, was to have it feel more intimate – more relatable. And that’s gonna come through playing even more close up, it’s gonna come through the environments playing out more richly when you’re in an enclosed space, and the way to do that is how we did it in Sims 4. And not having that open world allows us to create… for example you’ll see in the Get Together expansion pack, that when we have something like a cafe it’s gonna feel rich and it’s gonna feel like there are sims around and they’re in groups and their doing things and having activities. And it gives that intimate feel, and that’s purposeful. I agree that the Sims 3 open world had some problems,specially it caused the game to lag and the community lots were somewhat deserted.The closed world of Sims 4 made the way for the community lots to be bustled with Sims,more vibrant and fun.It have also immersed possibilities to get more rich community lot related game-play in future like the upcoming new community lot "Cafe" in The Sims™ 4 Get Together .And I think the fun I got running my bakery,interacting with customers and doing all the retail lot related task that came with The Sims™ 4 Get to Work was only possible to the closed world.Also,I can now split my family and progress the individual family life manually in a single save game in The Sims™ 4 which was also a feature of The Sims 2 that I missed in The Sims 3 due to the open world of The Sims 3 .But about to be feel connected with the town in The Sims™ 4 I do have a little problem not due to the loading screen I face each time I want to go out of my neighborhood,even when I want to visit my next door neighbor in the same neighborhood.The real problem is that when I send one of my Sims to a community lot,for example the park,giving some tasks to the rest of the sims at house,after I switch to my Sims at the house from the park,I see all of their tasks got reset and thus the house is in a mess.Similarly,switching back to my Sim at the park from the house give me the view that my Sim's tasks just got reset.So,basically I can control only my Sims at one lot at one time.As a result this made my Sims disconnected from the town and confined to their home more for visiting the town as less as possible.I don't know if it's a bug or it's a feature of The Sims™ 4 itself but I can assure that it ruins my game-play experience.In The Sims 3 I could see and control individual Sims doing different tasks at different places without any problem.So The Sims™ 4 though connect me more to the community lots than The Sims 3 but certainly does not connect me more to the town. Game Central :Were you surprised by the initial fan reaction to 4? In terms of either the nature or the volume of complaints? Rachel Franklin: I would say I was, yeah. I mean I think we took a really hard look at, ‘OK, what are they saying and what’s happening?’ And I think that a little bit of it, frankly, is that if I say something like, ‘Hey, we’re building a foundation with the base game that we’re gonna continue to build on and continue to expand’, that’s just me talking. But then when you actually do it and you add content in, and you add pools and you add ghosts and you add some career updates, and you add a Game pack and a Stuff pack, and all of these things adding up to each other that we come out with every month… all of a sudden I think people clued in. And it really hit me when we had a fan at an event and they said, ‘We get what you’re doing now, we get that this is truly something that will continue to grow over time. And I thought, ‘That’s what happens!’ Is that I said, but it doesn’t really mean anything until we show it. Game Central :I think it’s an industry wide problem now that gamers are just less trusting of publishers, that they no longer take their word for anything. Game Central :I know if someone tells me that a bug will be fixed or that content will be added just after launch, I can’t trust them anymore. We’ve all been bitten too many times. And even if that’s not your fault you, and every other developer, has still got to deal with it. Rachel Franklin:Right, right. And I think of it as two-fold, I think that we didn’t do a great job of exposing the content that was actually in the base game already. And The Sims is kind of funny that way, in that it’s a game that unfolds as you go through it and it takes a while to kind of really get into it and see, ‘Oh yeah, there could be this kind of reaction, that kind of reaction, the other kind of reaction’. It is kind of like life, it unfolds out in front of you, instead of giving out to you all in one go. And if you’re just doing an evaluation at one point in time you don’t really get that, you don’t really feel that until you’re really into it. And I don’t know if you found that when you’re playing it? Game Central :Reviewing games is a lot more difficult than it used to be! Both: [laughs] I know, right? Game Central :So where are you in The Sims 4 life cycle? This is the… second expansion pack? Rachel Franklin:That’s right. We’ve had two Game packs, we’ve had two expansion packs, we’ve had three updates as well. So there’s been quite a lot of content, and what I like about it, is that with the Game packs we can really be quite niche and really focused. If you look at something like Spa Day it allowed us to be really rich with one thing. Expansion packs are bigger and they can’t necessarily be so specific, as we’ve got to cover all of the different play styles. And so it’s important that we make it really broad-reaching. Get Together has a whole new world, called Windenburg, which I love because it’s European-inspired. And also we have this cool mix of old architecture and kind of modern culture mixed together, that mash-up together is really interesting. I don’t think we’ve ever done that before. Yes,I love the idea of the game pack as it really allowed me to get rich gameplay in a specific niche.I used to wish if I could have a functional spa day while playing The Sims 3 and The Sims™ 4 Spa Day game pack made my dream come true. Game Central :The Sims 2 looked really good, and I remember thinking at the time, ‘This is going to look photorealistic by the time it gets to 4 or 5’. But of course it doesn’t, you wouldn’t want that because it would look creepy and wrong. Rachel Franklin:Exactly, exactly! You don’t want that. So what’s really important in the balance of the art style is you’re gonna get those facial reactions, you’re gonna get those little things that a sim might do, like in the sauna they’ll [mimes being overcome with heat] ‘Oh, it’s a little bit hot!’. And you think, ‘Yeah, I do that’. But you don’t want them photorealistic because that’s creepy, that’s just weird. So that level of abstraction is really important for us to do. It’s the same with the architecture as well. It has to be the same level of, ‘Oh, that does look like a little cafe that might exist in my town but it’s not a perfect replica of anything. And so it allows you to play with it and get bonded to it emotionally, without it being so close that either it just ceases being fun and whimsical or it gets creepy. Game Central :The other technical issue though is the artificial intelligence, which is an even more difficult balance. And there I’m tempted to think it should be as realistic as possible. 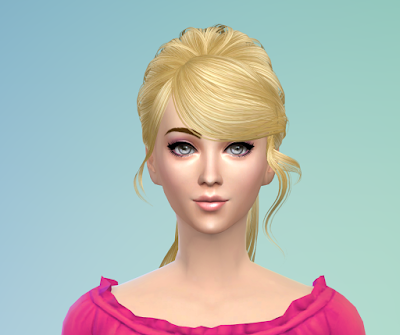 Rachel Franklin:Our little sims are pretty sophisticated, their traits are definitely integral to how they react and the things that they chose to do. If you look at the club system that we’re now introducing, that introduces a whole level of group activity to it. Their aspirations, they have all of these parts of their personality, and what we have to be careful of is that we’re not exposing so much of the simulation to the player that it becomes a math project instead of a game. And so I think it’s about choosing the things that we’re exposing to you as the player. Like the emotions, it’s very important for you to understand how a sims is feeling but if we share with you all of the different layers of trait management that would not be fun anymore. But those traits play a really big part in the choices they start making and the reactions they’re having, and then we bring that together into the emotions. I like the Sims 4 cartoony graphics but I don't think realistic graphics is creepy.I think realistic graphic is eye catching but to run a simulation game like The Sims™ 4 with realistic graphics I need to have a heavy machine which is not possible for every people including me. Game Central :So what are your medium and short term priorities for The Sims 4 at the moment? I was trying to check last night, and you still don’t have toddlers? Game Central :Is that something that’s going to come later, in maybe the next expansion? Since that is one of the main things fans are still asking for. Rachel Franklin:You know, our fans ask for a lot of things! [laughs] And here’s the thing, we look at a lot of different factors. We look absolutely at things that are being said in public forums. We also have groups of fans coming in, but we also have telemetry to tell us what people are actually playing with and using. Game Central :So you’re satisfied that not having toddlers was the right choice? Rachel Franklin:That’s the decision that we made based on all of the information that we had at the time. So absolutely, I feel like it’s the best decision for the game to date. I’m not talking about future stuff. But I do think it’s important to know, that players play in very different ways. We see all kinds of different play styles and family players are very passionate, so are players that play other ways. And I want to make sure that all of those voices are considered when people are thinking about whether or not we’ve included the right things. Because we do, we take it very seriously about whether or not we’re approaching all of those different play styles. We take it just as seriously as the players do that are asking for the things that they want. I truly loved the toddler life stage in The Sims 3 and The Sims 2 though I think according to EA telemetry majority of the simmers absolutely hate toddlers,probably that's why it was their best decision to remove toddlers.I'm also wondering if the majority hated the toddler in The Sims 3 then how toddler became one of the main things fan are still asking.And What was the 20,000+ petition about? I miss toddler life stage badly in The Sims™ 4 . To me Sims 4 does lack family oriented game-play and I'm a family oriented player.Also I'm playing with a certain life stage less does not mean I don't love that life stage,it means the game developer gave me less to do with that life stage or the span of that life stage is very short and also that doesn't mean other players don't love that stage.I age up the babies in The Sims™ 4 after a few moments of their birth,I used to do the same thing in The Sims 3 too but I used to play with the toddler stage for many sims days.Now if more simmers do just like me in The Sims™ 4 and as EA relies on telemetry,will they remove the baby stage too in the next sequel The Sims 5? Will my Sims give birth directly to a 5 yrs old child just like a newborn is now directly aging up to a grade-school kid in The Sims™ 4 ? Also,the android/iPad/iPhone version of The Sims,The Sims Freeplay just received a baby related update named Baby Steps in July,2015 which has similar features of the toddler in The Sims 3 though The Sims Freeplay already had toddler/pre-schooler stage .Now the android/iPad/iPhone The Sims Freeplay has four child related stage such as Infant,Toddler,Pre-schooler,Pre-teen where the PC/Mac The Sims™ 4 has only two Infant and Child.So,I think the EA telemetry says majority of the PC/Mac players of The Sims are not family oriented player.The Sims series was promoted to be played with life from Cradle To Grave , now with The Sims™ 4 I have to agree with one of my fellow simmer that it has become Bassinet to Night Club. Also,if removing toddlers from The Sims™ 4 is the best decision for the game to date,will EA do the mistake of adding toddlers to The Sims™ 4 in the future? Game Central :Was there never any thought to make the whole franchise subscription-based? There are a number of games I can think of that seem suitable for that and I’m always surprised it’s not introduced as an option. Especially given the success of EA Access. Rachel Franklin:You know, we talk about it all the time. For The Sims 4 it’s nice for people to pick and chose what they want to buy. Especially when we’re introducing new concepts with the Game packs. And our Stuff packs are very different from Sims 3. Sims 3 didn’t have gameplay in the Stuff Packs, our Stuff Packs actually have new scripted objects which have gameplay in them. So, it was important to introduce these monthly updates, which like I said I don’t think people really believed in at the time, and the new Game packs and Stuff packs already add a lot of new ways that we’re doing things. And so we definitely felt at that time that the ability for people to pick and chose exactly what they wanted to add was important. Now I feel more interested to spend my money on The Sims 4 stuff packs than before because of the added gameplay to the stuff packs. Game Central :And just finally, have you any plans to try and make a console version again? Rachel Franklin:We don’t have any plans right now but we are always looking at ways that we can make that work. It’s a challenge getting the game onto consoles but we’re always trying to figure it out. You can read the full interview on Metro. I would love to read your opinion on this in the comment box.